It's been quite a while since I took actual pen to paper but I know there are still a lot of people who do it quite often. I had those folks in mind when I designed this Terra Cotta Edge Flower Bouquet writing set. In this post, you'll find a stationery sheet design, a matching A2 envelope and a sticker to seal it. This design began as the photograph of a colorful flower bouquet of red and orange roses and yellow daisies. I'm sure if you follow my blog or my Chatter Corral blog you've seen that I enjoy trying out new photo editing techniques. I was quite pleased with this photo edit so I designed numerous products using it. The writing products that I mentioned above would collectively or singularly make a great gift. If you plan now you might consider presenting some of these to a special teacher at some point during the school year or at the end of the school year. You could coordinate it with several parents so it's a very reasonable cost. A nice practice at Zazzle is that you can purchase different designs and still earn a stationery volume discount which starts with a purchase of 25 sheets. You'll find two stationery designs here. The stationery sheet in the upper right has a diminished opacity use of the design and the sheet on the left has the design as a corner detail. Both designs allow for personalizing by adding text in place of what is currently on the template. Although both have name text at the top and address information at the bottom, both can be easily changed or totally removed for an entirely blank sheet. In my Zazzle store TheAspenStand, you will find another sheet design where the bouquet is on the bottom right corner and allows for the same personalizing. As I mentioned in the lead there are A2 sized envelopes using the same design. The envelope above features the entire design inside and outside. The outside design is at a diminished opacity so as not to interfere with address text. On this design, you can customize it by selecting a different envelope color. 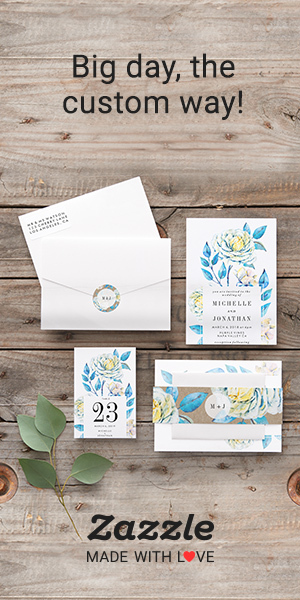 When you visit the Terra Cotta Edged Flower Bouquet category in the store, you will also see that envelope style with the bouquet in the lower right corner. Add round stickers to seal the matching envelopes. These 1.5" diameter stickers are available with the background you see above or a white background. If you simply like the sticker, you can also get a sheet of 6, 3" diameter stickers. To round out a very nice gift package, see the Terra Cotta Edged Flower Bouquet postage stamp that complements the envelope. You can find 40+ products with the Terra Cotta Edged Flower Bouquet design including greeting cards and aprons in TheAspenStand online store. Before you head off to check out the products, leave a comment to let me know your thoughts on the design and post. These are lovely, Patricia! I think good old-fashioned thank you notes are going the way of the dinosaur, and people who send them definitely stand out from the crowd--in a good way! I do believe you are correct about the hand written card Carol. I have seen stationery used but it was run through a printer with a nice note. That's still a nice touch showing appreciation. Thanks again for checking out and commenting on the post.